Whether you’re tuning into the Super Bowl for the game or simply popping in for the commercials, a spread of appetizers is pretty much a requirement. Making any of these 7 small bites will surely score you a few points with your family and friends! Need more inspiration? 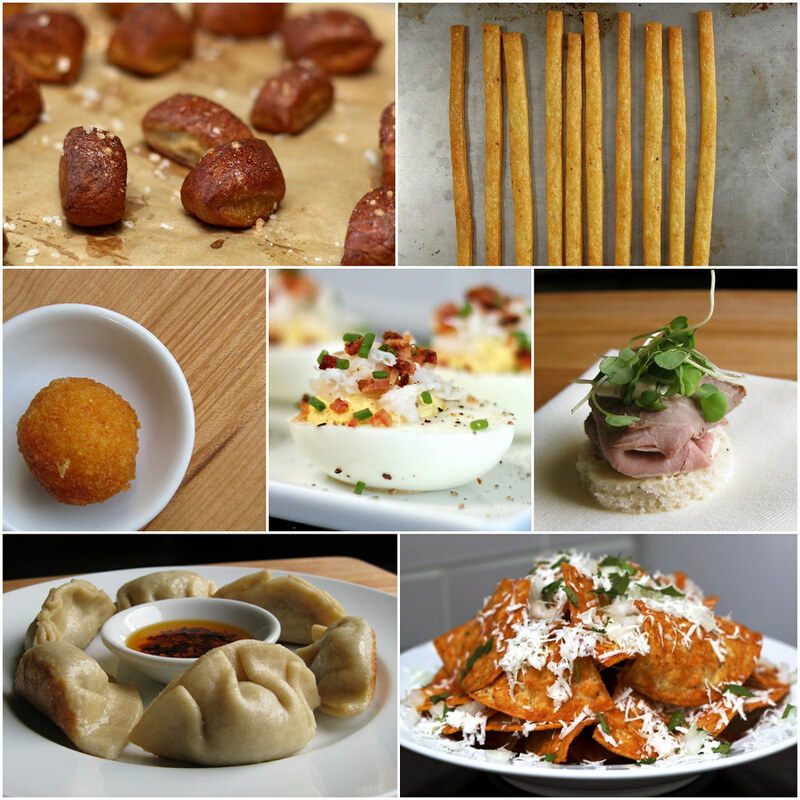 Check out the entire appetizer collection here! Pretzel fans will devour these petite, somewhat buttery bites. I love ’em dipped in Dijon mustard, but you can’t go wrong with cheese sauce, either! Bonus: Once you master this dough recipe, the wonderful world of brioche goodness will be opened to you. Impress your guests with these surprisingly easy to make (no phyllo dough here!) flaky homemade crackers. Vary the amount of red pepper flakes to customize the spice experience, or give a Parmesan and poppy seed combo a try instead. Filled with a soft, somewhat spicy salumi from one of my favorite local salumerias, these fried, meaty bites are a unique twist on the typical — but no less tasty — arancini di riso. Not your ordinary deviled eggs, these are topped with bacon or crab to make a tasty treat that works well whether San Francisco or Seattle makes it to the big game. These whole grain Dijonnaise and micro arugula-topped sandwiches might skew a bit on the twee side, but are pretty much guaranteed to be a hit! Don’t feel like making homemade bread? Go ahead and use slices of Udi’s soft sandwich bread instead! I’m kind of obsessed with this twist on chips and salsa. You’ll love that the homemade arbol chile sauce can be made days ahead to help streamline your party planning. Toss the kicky salsa with oven-warmed chips (store bought), and layer with an array of goodies — finely chopped onion, cheese and cilantro — to create a stunning pile of finger-licking goodness. What’s your go to gluten-free appetizer recipe? Links welcome! Let’s talk in the comments or on Facebook or Twitter! Velveeta Shortage? No Big Deal! 5 from scratch cheese sauce recipes for the Super Bowl Grown Up and Gluten-free "Tuna Snacks"